Qatar has signed a $12bn deal to buy F-15 fighters jets from the US. The sale was finalised at a meeting in Washington between US defence chief Jim Mattis and his Qatari counterpart. 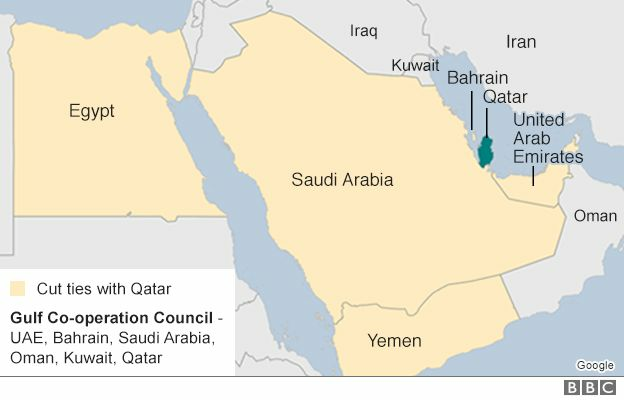 It comes days after US President Donald Trump accused Qatar - a major US ally - of funding terrorism "at a very high level" - a charge Qatar denies. Other Gulf countries recently cut ties with Doha, accusing it of destabilising the region through its alleged support of extremist groups and links to Iran. Qatar is home to the biggest US air base in the Middle East, Al-Udeid. It houses around 10,000 troops and plays a key role in the US-led operations against the so-called Islamic State (IS) group in Syria and Iraq. Mr Trump's comments appeared at odds with the US Department of Defence, which had praised Qatar's "enduring commitment to regional security" just days earlier. Saudi Arabia, another key US ally, has led moves to isolate the gas-rich emirate since earlier this month. Riyadh sealed its border, closed its air space to Qatari Airways and - along with Bahrain, the UAE and Egypt - severed diplomatic relations. A Qatari official said the deal for the fighter planes was "proof that US institutions are with us but we have never doubted that," Reuters news agency reported. "Our militaries are like brothers. America's support for Qatar is deep-rooted and not easily influenced by political changes," the unnamed official was quoted as saying. A Qatari defence ministry source told Reuters Doha had bought 36 of the planes. The deal comes just weeks after the US agreed to sell the Saudis more than $100bn-worth of weapons. As tensions between Qatar and its neighbours escalate, Turkish Foreign Minister Mevlut Cavusoglu was due in Kuwait on Thursday as part of a shuttle mission to try to resolve the crisis. Turkish President Recep Tayyip Erdogan has strongly backed Qatar, calling the Saudi-led measures "inhumane and against Islamic values". Kuwait has also been mediating. Last week, the Turkish parliament authorised the deployment of Turkish troops to Qatar in what was seen as a show of support for the embattled emirate. Ankara has also sent planeloads of food to Qatar, which had been dependant on imports from Saudi Arabia.